He plays me the Prelude, from the orchestral sketch! My emotion lasts long - then he speaks to me about this feature, in the mystery of the Grail, of blood turning into wine, which permits us to turn our gaze refreshed back to earth, whereas the conversion of wine into blood draws us away from the earth. Programme Note for King Ludwig: "Love - Faith - Hope?" Already for the Prelude to Act I, Wagner invents an exemplary, wholly new form for the entire piece – no longer, as in his earlier works, a musical synopsis but a way to develop thought during the musical silences. Tellingly, the Prelude begins with a pause, contains six instances of total musical silence and altogether six general pauses, thus setting out the work’s fundamental structural argument. The silence and the pauses have become the music’s determining factor. In these pauses the music continues to develop, unheard, a fact that becomes clear when the music continues without ever repeating the same thing again. In the pauses time and thought leap forward, a leap that can be heard in the ensuing music. This can only be made clear in the interpretation if the basic tempo and the relationship between tempi correspond to the composer’s fundamental ideas and if the production gives the music the ‘space’ for the ‘time’. Figure 1. Opening melody of the Prelude to Act 1, which I have called Grundthema. Redemption - the melody to which, at the end of the work, the chorus sing, "Erlösung dem Erlöser" (2 - motif 1A in the Guide). With a small modification, this rising phrase is used to represent the Grail Knights and, omitting the first note, Communion (3). The second phrase of the melody (1B), containing a falling fifth, is related to the Guilt of Amfortas. The third phrase (1C) is the motif of the Spear. 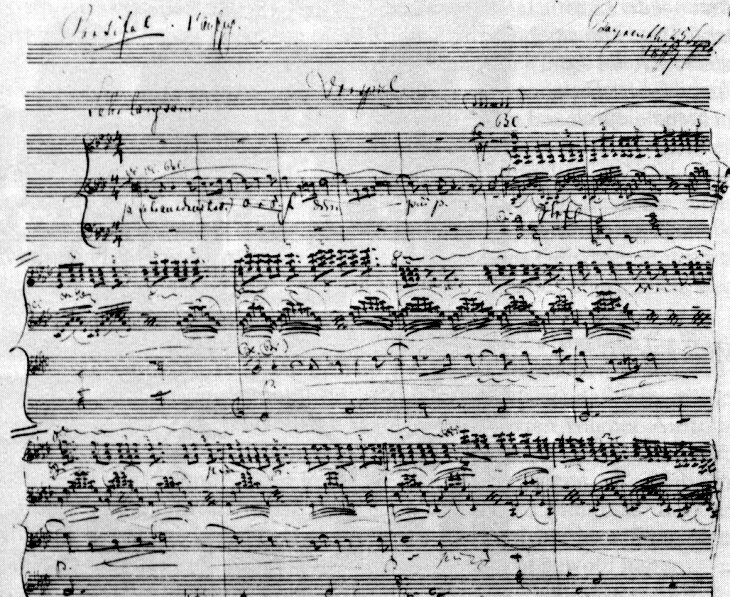 This motif is important in the third act prelude, when Parsifal is bearing the sacred spear. t is interesting to note how, already in the first bars of the work, uncertainty has been established, with the ambiguity between A flat major and c minor. This uncertainty is a characteristic of the domain of the Grail as the work begins. Note also that this melody ends on the mediant: one of the unusual features of Parsifal is the relative importance of mediant key relationships. t is not difficult to find the traditional forms of opera beneath Wagner's music. The prelude may be considered as a derivative of the classical, three movement overture. The first movement is in two sections of 19 bars each, the second being a developed restatement of the first; it is followed by a broader movement of 39 bars; and the final movement begins at bar 78, lasting (apparently) for 36 bars. he prelude differs from a classical overture in at least one important respect: instead of returning to the opening tonality of A flat major, it ends on the dominant (unless the concert ending is played). Structurally, the end of the prelude is reached at the sixth bar of the first act, with Gurnemanz's words so wacht es mindest am Morgen . Hence the prelude is tightly linked to the first act. he first section of the prelude presents the rich source theme described above, in the initial tonality of A flat major. Wagner blends the timbres of wind instruments (clarinet and bassoon, joined by cor anglais) with strings (violins and celli). The second section is essentially a repeat, with the key raised to the mediant, c minor, and only small changes in orchestration. he second movement begins at bar 39 with a new idea, the ethereal motif of the Holy Grail (motif 2 in the Guide), in the original key of A flat, although we soon hear other keys (G flat major and D major). The theme of Faith (motif 3 in the Guide) is revealed in a grand, wind chorale; the Grail theme returns, followed by an extended, sequential meditation on the idea of Faith (1 below). Already it is obvious that, in his orchestrational technique, Wagner has returned to the more blocked style of his earlier works. ushed, tremolando strings introduce the final movement of the prelude at bar 78, which returns to the source theme. It is the third attempt to develop this theme; there seem to have been two failures in the first movement; perhaps this attempt will be successful? Parts of it are now developed, thematically and rhythmically, although the developments do not seem to lead anywhere. New ideas, later to be related to the pain and Agony (3A above, motif 22 in the Guide) of Amfortas, are subtly introduced into the fabric, suggesting that beneath the confident, sunlit surface, all is not well in the domain of the Grail.